I recently told the story of How I Lost an Election, which had the side effect of me enrolling in night classes at my local community college while I was still in high school. It was during that year of taking both college and high school courses that I learned a valuable lesson about succeeding in education—and in business. To be clear, these weren’t some upper-level high school classes that I took at the high school. I actually went to the college and attended classes with a bunch of older students. (I highly recommend this for any high-school-aged kids, by the way.) At the time, I had the idea that maybe I would become a doctor, so I signed up for classes that I thought would be helpful in that pursuit. The first class I took was Anatomy and Physiology. As I sat in class the first day, I heard other students say they’d heard how hard this class was and they were concerned about passing it. This, of course, made me nervous about what I was getting myself into. The textbook was at least three inches thick. As I scanned through pages, I could feel a sense of doubt taking hold in my mind. Up to that point, I hadn’t been a stellar student anyway. I’ve written about How I Sucked at School, so I didn’t have much, if any, confidence. At the time I was barely passing my high school chemistry and algebra, and only then with private tutoring from my teachers before school. I enrolled in college as a high school kid out of the desire to escape. I didn’t want to be stuck in my town forever. I wanted out. It’s not that I hated it there. At 17 years old, I really wanted to re-create myself someplace where nobody knew me. But my grades were mediocre, and I totally choked every time I took college placement exams. I was delighted to learn there were no restrictions keeping me from taking college level classes in my hometown. I figured if I failed, that would be a sign that I shouldn’t go to college anyway. The professor’s first lesson on anatomy and physiology was about muscles. I realized I actually knew some of the answers to questions she was asking the class. For the past two years, I had spent a few nights each week working the front desk at the only gym in our town—I passed the boring hours reading back issues of Muscle magazine. Apparently, I absorbed something more useful than how to get six-pack abs in six weeks. Also, the class seemed impressed when they learned I was a high school student. By the end of the first day, I was still feeling overwhelmed. But I hoped that if I studied hard enough, I could somehow pass the class. The class lasted the full semester, and it was indeed challenging. I showed up for every class and took as many notes as possible. The textbook chapters seemed like they were written in a foreign language. In the end, I finished the class with a B or B-. I can’t quite remember. But it was something the teacher announced to the whole class on the final day that I will never forget. At first I didn’t think that was such a big deal. I couldn’t imagine missing a single class—I would fall so far behind, I wouldn’t be able to catch up. Plus the class was expensive. I didn’t want to ever have to go through it again. But with deeper reflection, I was reminded that college is voluntary. Attending class is a choice. It’s not like high school where you’re forced to go. In college, if you’re tired or have a fun opportunity with friends, you might skip a class or two. But the more I went to college classes, the more I realized that it was rare for a student to attend every class and to be actively engaged, as opposed to sitting in the back barely paying attention. School was just too hard for me to afford such luxuries. I quickly learned with college classes that I was practically guaranteed a B or a C if I just showed up to every class. I sat near the front and occasionally asked questions. Teachers appreciated the fact that I was present and paid attention. Once I passed the most difficult classes on campus—by basically showing up and paying attention—I gained confidence with education and with learning in general. In life and in business, I’ve succeeded where others have failed because I simply showed up more than they did. If I had a problem with my website, I studied how to fix it myself or learned an inexpensive way to hire someone. When a client asked me to help with something I wasn’t familiar with, I stayed up half the night learning everything I could about it so I could be a useful resource the next day. 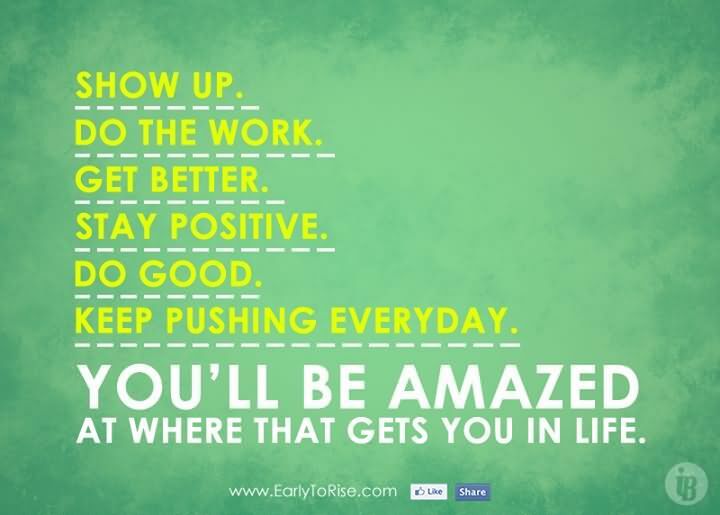 I’ve learned that showing up is the key ingredient to success. I was at a dinner party recently, and I got to talking with my friends’ teenage daughter about college. I told her the story about my first year away from home at the university. Almost half of my friends flunked out their first year—not because college was tougher than high school, but because they regularly blew off going to class, figuring they would just cram before the test and look over other people’s notes. I shared with her my little secret of “just showing up.” I hope she takes my advice. I know what her parents are paying for her to attend college—but more importantly, I know what it does for your confidence to overcome great challenges by simply committing to show up and face them.